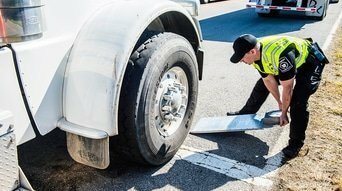 Fleet vehicles may be required to go through a roadside inspection in order to prove their safety and performance to inspectors from the Commercial Vehicle Safety Alliance. Drivers should know what to expect during the level 1 inspection process, and so within this post, our team at STTC explains a little more about inspections and how to pass the roadside inspection. One of the most important considerations is the condition of the wheels and wheel wells. Before every trip, drivers should be trained to check the wheel wells for excess oil, and if any excess residue is found, it must be cleaned immediately. When the area is left unclean, the inspecting officer might suspect the vehicle has an oil leak and pull the vehicle from the road. Maintenance teams should check under the brakes of the vehicle for signs of abnormalities before they set off on their trip. These abnormalities will capture the attention of the inspection team, who will then remove the vehicle from the road until the issue is resolved. Check for cracks and leaks that could cause changes to the components. The inspector may ask the driver about their electronic logging system for hours driven and it’s critical that drivers are able to answer questions about the unit and its performance. Fleet operators should ensure that drivers have a robust knowledge of their electronic logging unit before heading out on the road. One of the most common mistakes drivers make when going through the Level 1 inspection process is not being friendly with the inspector. This can often cause the inspector to take more time with the vehicle and may lead to the inspector believing the driver’s company has a reputation for poorly-trained drivers. Drivers who are rude to the inspector may be reported to their carrier for further action. While the inspection process may take as long as an hour, it’s important to remain calm and in control and to respond carefully when speaking with the inspector. By acting calmly and following all proper safety precautions, drivers can pass the Level 1 Inspection process seamlessly. To learn more about the inspection stages and the requirements to pass the inspection, call our roadside assistance team today.